Genesis is my favorite WordPress Theme Framework. On Crunchify, we have published more than 100 tricks and tips on customizing Genesis Child theme. 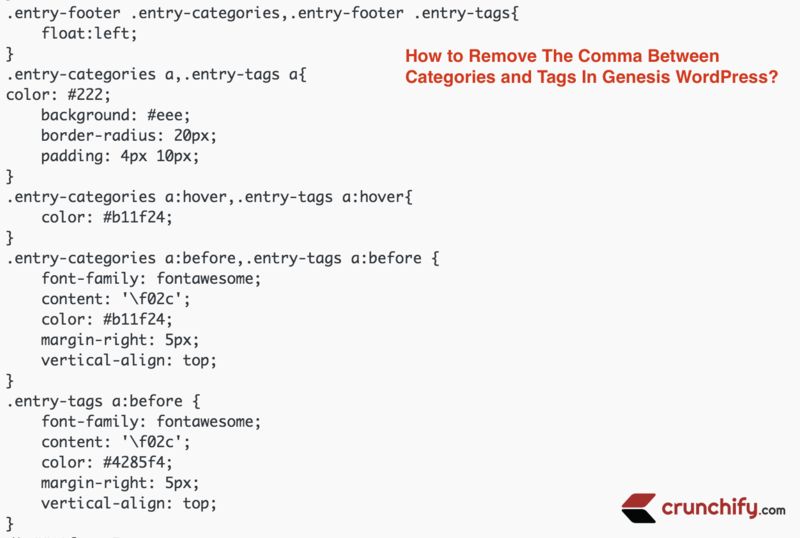 In this tutorial we will go over how to customize and remove Comma between Categories and Tags for your Genesis WordPress theme. Take a look at below Categories and Tags on Crunchify site. First thing first. Here is a code to modify Genesis Post Meta values. Just add sep="" into post_categories and post_tags Genesis hook and it will bypass omitting Comma (,) after reach tags and categories. Also, if you want to achieve same effect as Crunchify, you may need to remove Filed Under text also and hence we are using before="" arguments too. I know, it’s very simple but I’m sure this will help you beautify your site. Happy blogging. Thanks App Shah for nice tutorial but have some problem in my theme. I’m using default Genesis Theme and need help on CSS. Sent an email already. Kindly reply. Hey Prakash – just replied to your email. Provided you an updated CSS code. Hope it works for you.